It's been a long time coming but finally the follow up to 2007's Human The Death Dance drops and it sees Mr. Francis all grown up. 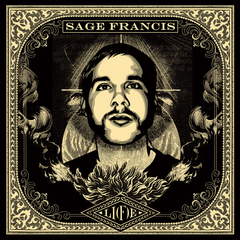 I remember seeing Sage Francis at Plastic People many many years ago as he stood in the middle of the crowd spitting venomously into his mic and backed by a CD of recorded beats that he himself had to operate. Well Li(f)e is a far cry from that set up and is the first time Sage's unique and intricate poetry is given the panoramic backdrop of a a full and live band, not to mention the guest appearances. Opener Little Houdini sees Sage hook up with Grandaddy's Jason Lytle and Slow Man teems up with Joey Burns of Calexico. The result is a far richer concoction and one that works on may levels. It's more low key than previous releases and the warmth with which his beats emanate seem to give Sage's rhymes more body. Three Sheets To The Wind livens up the general slow pace with Death Cab For Cutie's Chris Walla on guitar, Slow Man shimmers with midwest heat and closer The Best OF Times continues Sage's tradition of ending on an epic note. WIth rich orchestration he wrenches the heartstrings to the bitter end.